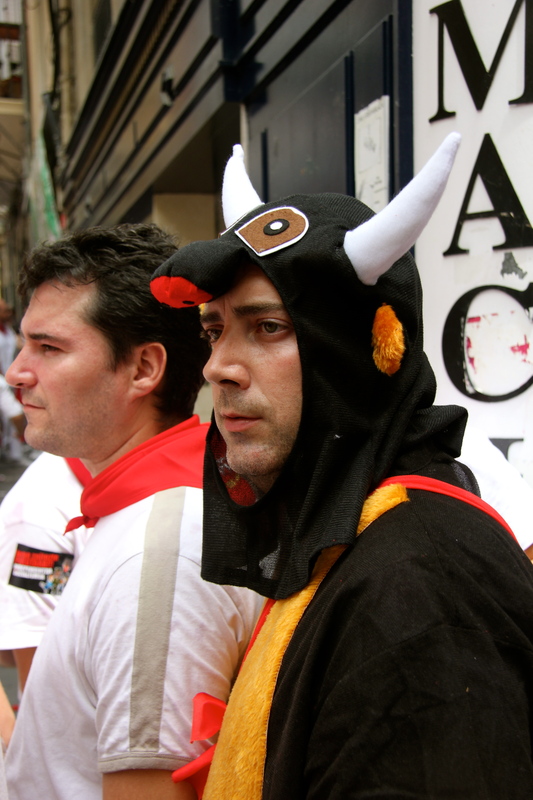 A party-goer dressed in a bull suit during the open day of the fiesta. 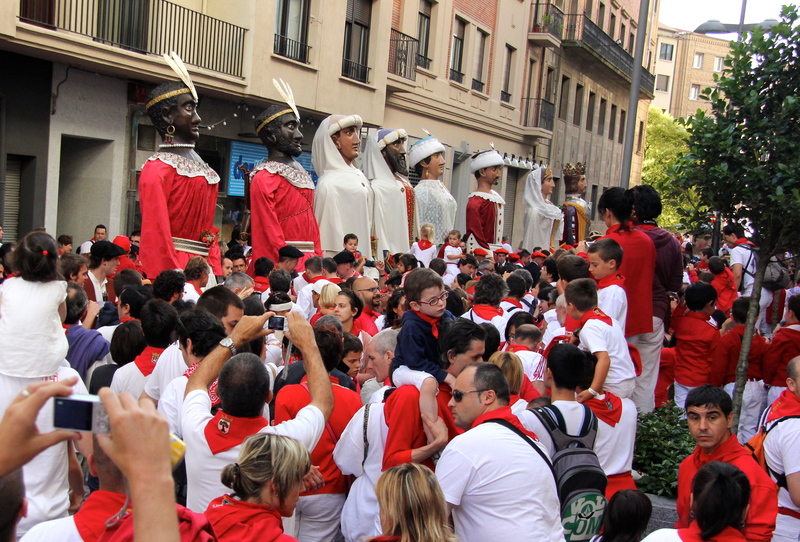 There are several Fiesta Taurina (games with bulls) events other than the Encierro (“Running of the Bulls”) at the week-long San Fermin Festival in Pamplona, Spain. 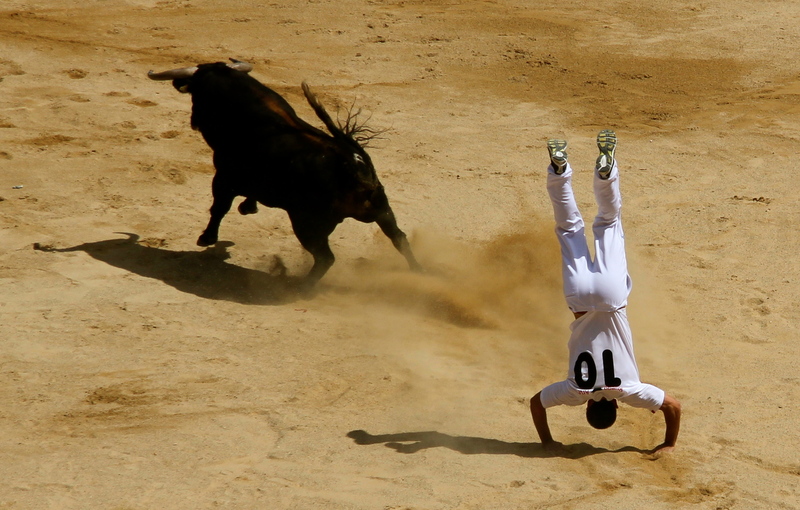 In addition to the bull run and bull fights each day, there is a Novillero Corrida (novice bullfight), a Corrida de Rejones (bullfight on horseback), the Vaquilla (games with heifers) and Concurso de Recortes (bull-leaping acrobatics). 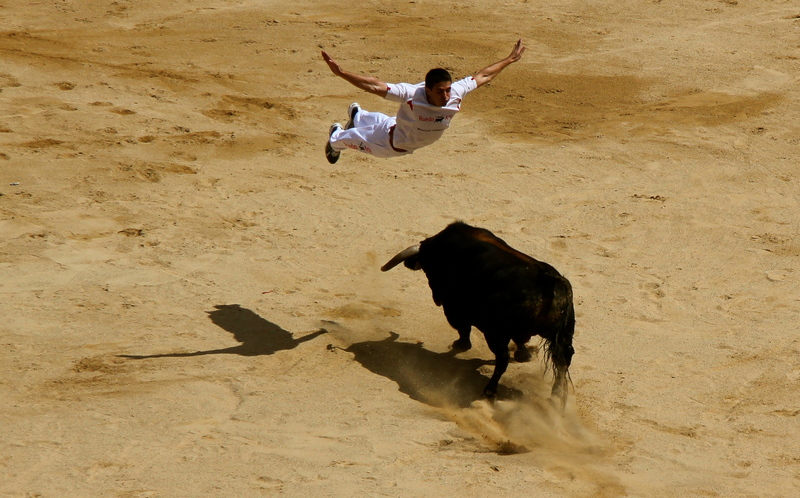 Bull leaping acrobatics is a non-violent form of games with bulls in which a team of four compete against each other. 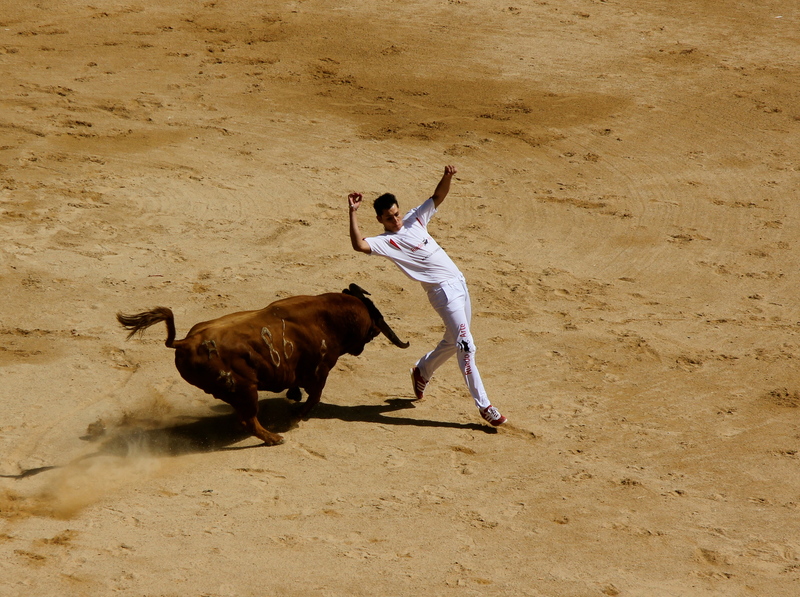 The unarmed competitors confront bulls At face to face in the ring and only through immaculate agility and timing do they avoid being pummeled by bulls. 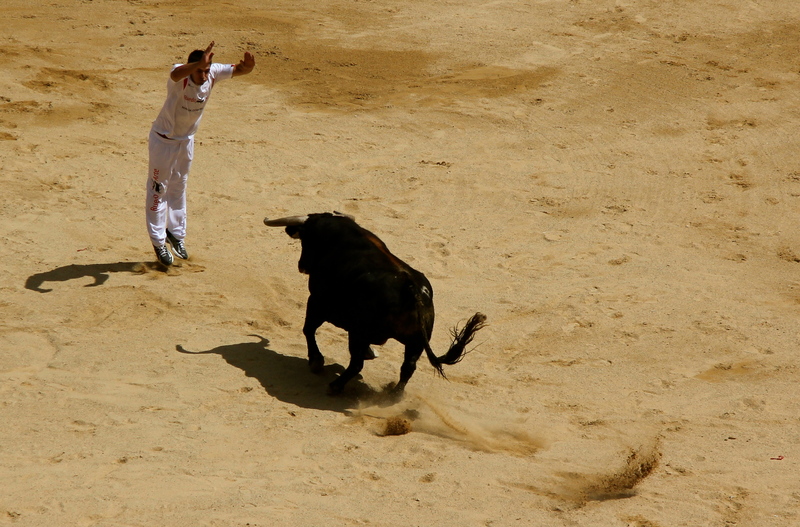 Each individual is scored individually, but their success depends on their team mates to encourage the bulls to charge in straight line and distract the bull if the leaper gets into a dangerous situation. In my opinion the bull leapers have more courage than matadors as the the bulls they encounter in the ring are at the height of their power—unlike fighting bulls that are wounded and loosing blood throughout the fight—and come within inches of the 1,500 pound animals. 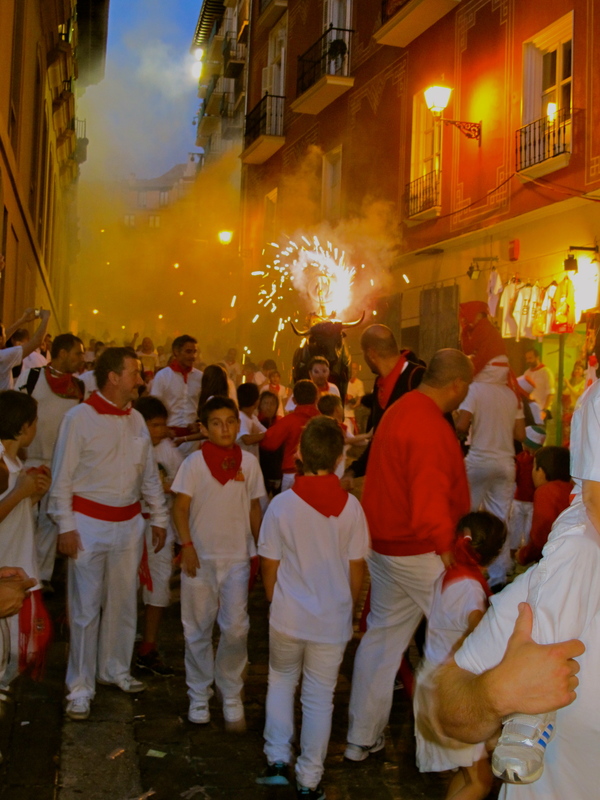 Another daily taurine event is the “Firecracker Bull” in which a man holding a statue of a bull rigged with fireworks chases children through the streets at 10 p.m. every night of the festival. 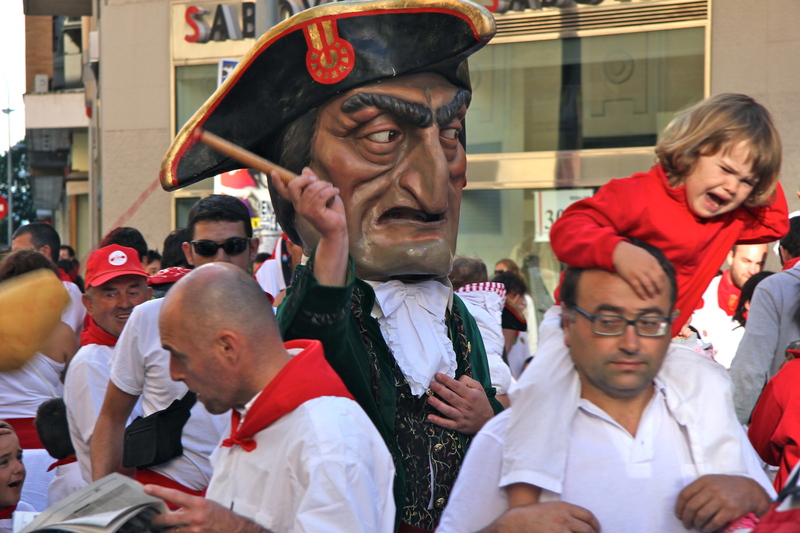 Another popular feature of the festival is “The Parade of Gigantes y Cabezudos (Big Heads and Giants)” that occurs every day at 9 a.m. leaving from the bus station. 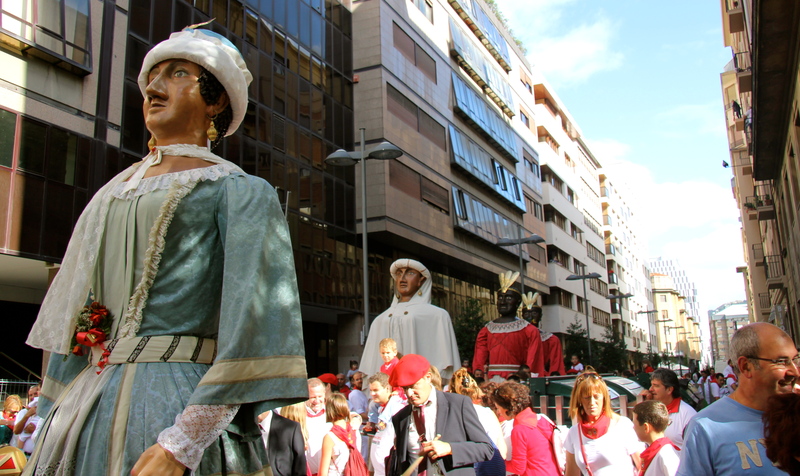 The “giants” were created out of papier mache in 1860 and represent kings and queens from the four different continents, Europe, Asia, America and Africa. The “big heads” consist of zaldikos that look like they are mounted astride horses and kilikis, trickster figures that chase children and women with foam truncheons. 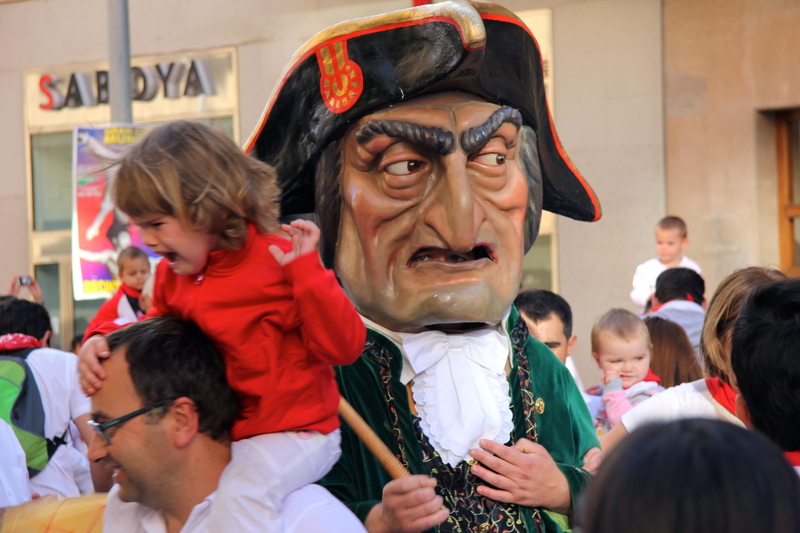 Kilikis are trickster figures that chase children and women with a foam trunchen. This image captures the moment after a kilikis has made a direct hit. 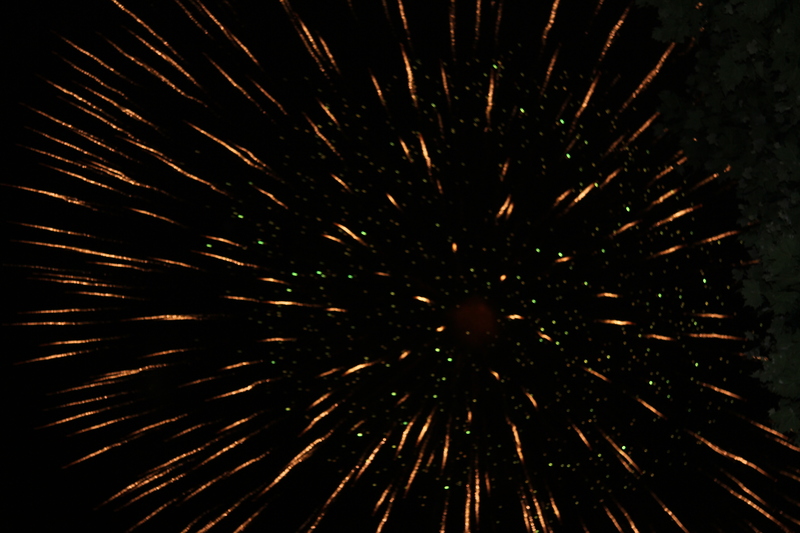 And the fireworks competition that starts every night at 11 p.m. 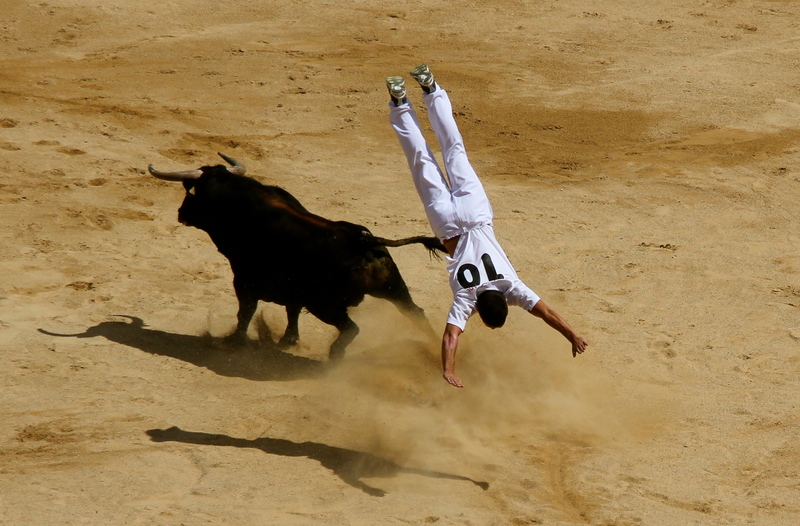 This entry was posted in Spain and tagged Bullfighting, Festivals, pamplona spain, Spain, Travel. Bookmark the permalink.